Last week - we invited you to explore your inner Ninja. This week - we're going waaaay back in time - so that you can explore your inner cave person, with Stones and Leather! We've come a long way from the days when impressing the ladies-who-lunch-on-roast-wildebeest at the local festival-of-the-returning-sun meant chasing a buffalo through the forest and trying to pull it's tail hairs out, or salvaging a scrap of leather for tanning before the wild dogs scavenged it, or just looking for shiny pebbles on the beach - which was, at least, less risky. Until the tide came in. Now we have a whole rainbow of colours to choose from - heck - we have more words for colours than ever before! Stones from earthy Porcelain Jasper, delicate Rose Quartz, primal Amethyst, in matte, no less! Fiery Carnelian, to mystical Jade and bewitching Pyrite, a wide range of stones and colours to make you happy! So, if you think we've come a long way, baby, remember, everything old is new again, and in the circle of life, the wheels on the bus go 'round and 'round. As always, wonderful, wonderful things - all over the site. I leave you to explore at your leisure. Click on a link or an image to go straight to the item mentioned above, or go to our massive list of everything, or if that page seems overwhelming - which we freely admit it is! 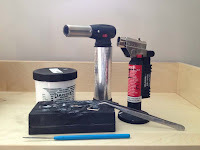 - then try for bite-size portions by checking out these categories: Firepolish, Pressed Glass, Swarovski Crystal, Seedbeads, Stone and Pearls, Preciosa Crystal, Metal Beads, Other Cool Beads, Findings, Metal Clay & Supplies or Books, Kits, Tools. "A new two-hole seedbead. It looks a little like those domino masks for a maskerade party - but with two holes, there are many, many new possibilities for new designs. Actually I should explain here that there are two very similar beads that are small, oval beads with two holes in them. We have both the Twins and the Superduos. The difference is the Superduos are more exactingly made, and a little more substantial - they are a little heavier. And, as such, a little more expensive than their plainer cousins - the Twins. The Superduos also come in some more interesting finishes and colour variations. If you think that is confusing - well, you are in good company." Thanks to Jennifer VanBenschoten, editor of Beading Daily, for explaining the difference in the manufacturing of the beads. "SuperDuo seed beads are pressed glass beads, meaning that they are made in a mold so that each bead is highly consistent in shape and size. Twin seed beads, on the other hand, are manufactured according to traditional Czech seed bead making techniques where the beads are drawn, cut, and tumbled, resulting in a more variable shape and size." 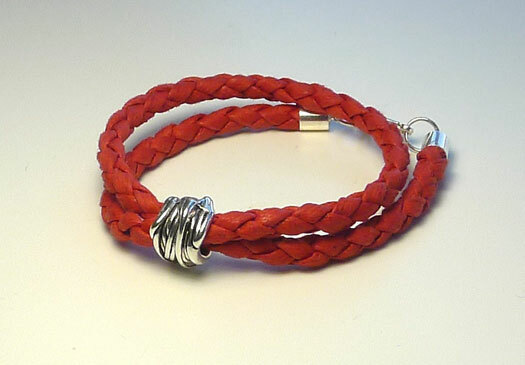 I realized there was a definite difference in size when I started designing a bracelet using twins in a right angle weave stitch. The SuperDuos are definitely bigger and created a larger space between the RAW units than the Twin seedbeads did. I had to add in some 15/0 seedbeads when using the SuperDuos with 4mm Swarovski Crystal pearls and bicones in 4mm. So they are not totally interchangeable. If a pattern calls for one or the other, choose wisely unless you want to start making adjustments to the pattern. I made the green bracelet with SuperDuo's, 2.5mm Swarovski Crystal bicones and size 15/0 seedbeads. The purple bracelet is made with SuperDuo's, 4 mm Swarovski bicones in Crystal Golden Shadow and 15/0 Charlottes in Bronze (tb15r221). The black and silver bracelet is made with Twins, 4mm Swarovski Crystal bicones and pearls with 15/0 seedbeads. You can see that I had to add in the 15/0 Charlottes for the purple bracelet in between the bicones. Maybe if I didn't add the Charlottes in the RAW unit, I wouldn't have needed to add them in with the crystals. Designing is all about trial and error and working through variations until what you make looks like the picture in your head! 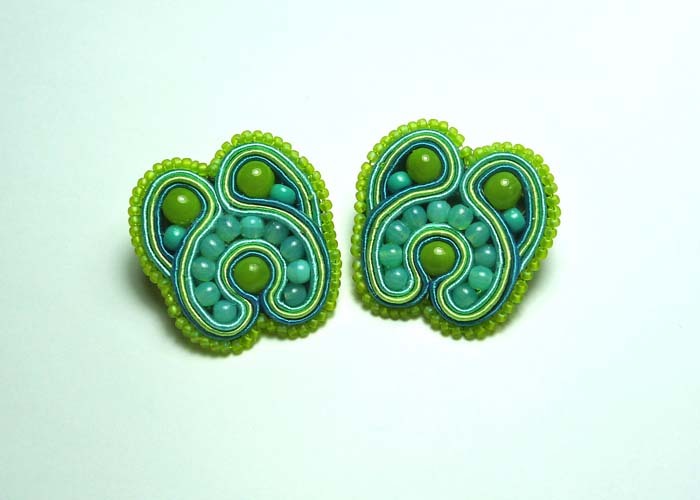 Preciosa has some really nice patterns using the Twin beads on their website if you want some free patterns. Have you made anything with them yet? Let us know by leaving a comment below. Learning how to use a jeweller’s saw will open up endless possibilities in jewellery design and construction. In this class you will first learn about the tools (saw frame, blades and bench pin) followed by instruction in their proper use. Finally, you will start to develop your skills by sawing lines, shapes and cutouts. This class teaches The Harp Shape Module and will expand on the skills learning the Basic Module class. Techniques to be covered include how to handle the soutache braid, manage tension, place stitches correctly, maintain the curve, and add multiple beads. These techniques will be used to make a pair of Harp Shape earrings with design options. 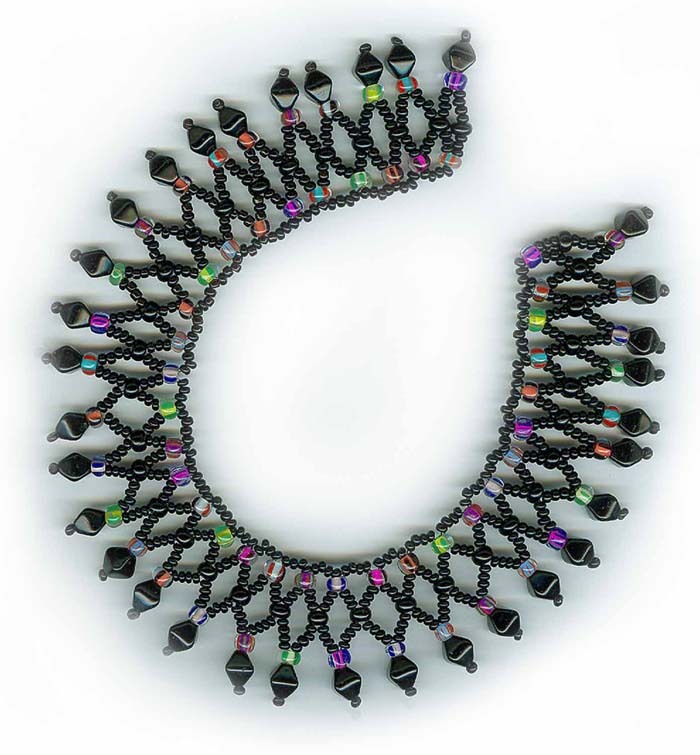 Choose your level of initiation into world of netting with richly textured beads. 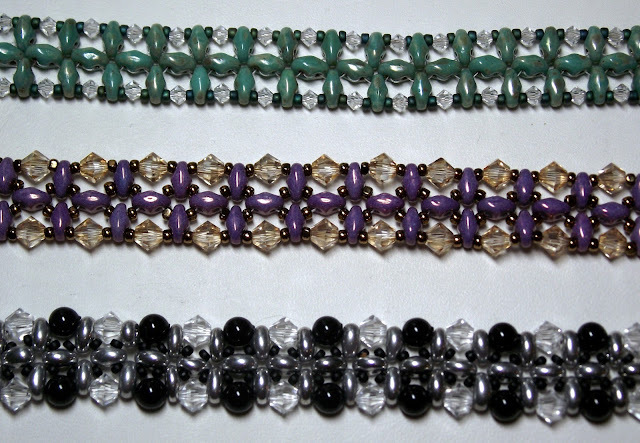 Start by stringing a combination of beads, turn around through the accent bead and begin netting. Work top to bottom for full control of how long to make your beadwork. Hard to believe that simple vertical netting could produce such a vast array of styles! Dive in! In the “Simply Luxurious Net” extraordinarily luxurious results are achieved with the combo of bugle-tipped baubles, picots and occasional accents of a Swarovski® bicones. This is a great way to get into beading and learn the different edge finishes. Try the Glitter Earrings next. 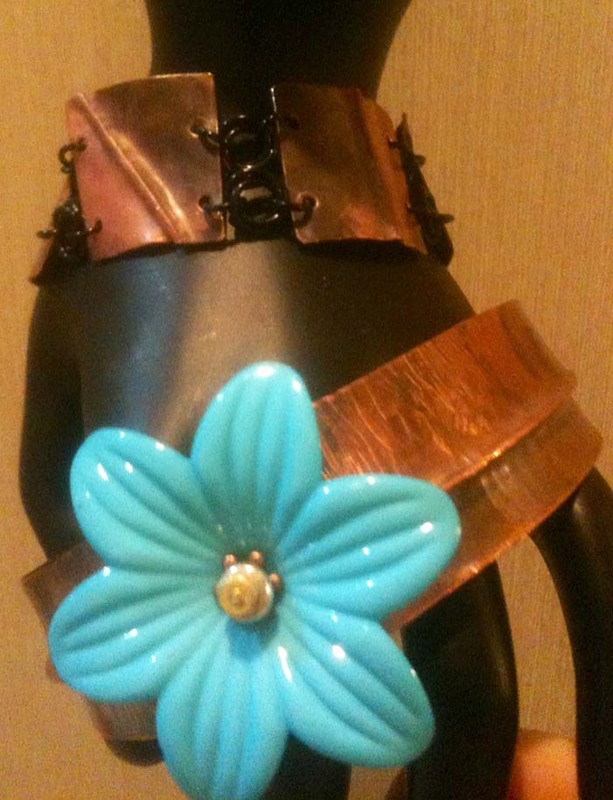 Learn how to create beautiful folds in copper and create these two very different bracelets using the same technique: foldforming. One bracelet is composed of 1 x 1 inch copper squares joined by basic chain mail. The other is cut out then folded and formed around a bracelet mandrel. You can embellish with your own focal if you like. AND ... there are lots more classes than these listed! For more information on all of the classes that BeadFX is offering, go to www.beadfx.com and follow the link to classes. I've spent this uber awful icy/rainy morning with a few cups of coffee, and pinterest. It's Monday - I refuse to go outside, and I needed some inspiration on what to make the girls for Valentines day presents. I've created a board - Be My Valentine. I hope it inspires you! This week, I thought I'd share a project that Dwyn made a while back. 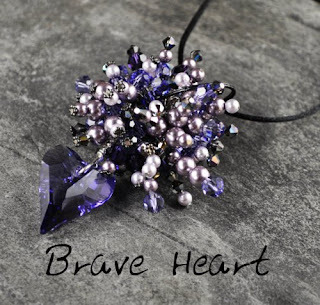 (last year or the year before that) You may remember Brave Heart - this was one of the projects that she created for Swarovski in Tucson. Divide the daisy spacers into 2 piles. Use the Artistic Wire to create a wrapped loop for the Wild Heart. When they are all strung on, tie the two ends of the Softflex together, so you are knotting the strand into a big circle. Add the Link (Circle Ring) and knot again inside the link. So you have a circle of the Softflex, with all the beads on it, with the Heart on the bottom, and opposite the heart, there is a knot, and the link, and then knot inside the link. My obsession lately has been becoming mesmerized by the potential of 3D printers. Again, I am a fan of creating with my hands but the science fiction aspect of inputting a design into a computer and a machine actually printing it out fascinates me. I found this video of a 3-D printer being used in the food industry. They are designing a printer that will print anything in a paste form. Can you imagine what you could make with metal clay paste and this machine. I have taught many students to use syringe and I would say that the majority of students I have had struggle with keeping their hand steady. Myself included, I can use paste to entrap a stone and make organic looking details but I have never been able to produce anything that didn't have that "organic" look (when I say organic, I mean imperfect or perhaps even a bit messy). The machine is not cost effective but imagine the fun you could have!!!! The Business Chat - Lose weight instantly! Just take our magic pill once a day and the pounds will slip away while you eat on the couch! Now really, who would believe something like that? Everyone knows that if you want to lose weight you have to change your eating habits, eat less, exercise more and be patient. It takes time and effort to lose weight. There are no magic pills. We're too smart to believe in that. Yet for some reason, our smarts seem to disappear when it comes to running our micro business. I had a phone call this week from "Amy" who has been attempting to get her business going for a couple of years now. The problem for Amy is that she keeps looking for the magic pills. Amy was super excited because she was applying to a very large craft show with a great reputation. She was all in a tizzy because the show is in 7 months and she didn't know how she'd find the time to make all the inventory she needed. One of her favourite pieces is a large necklace that she sells for $195. She wanted to know how many I thought she should make, 80 or 100? I'm still laughing. For someone whose best show was $1000 in sales, thinking that she'd sell almost $20,000 of this one necklace in a weekend was beyond stupid. But it's the magic pill effect. She thought that just because she was in one of the best shows her sales would magically appear. Just being in a show won't bring in sales. Just having an online store won't bring in sales. Just getting your work into a store won't bring in sales. Just having a Facebook page, twitter account, pinterst board won't bring in sales. Wait, those things are work! Yes, yes they are. Just as there are no magic pills for dieting there are no magic formulas for success in your business. No e-course, no show, no web designer can magically bring you success. 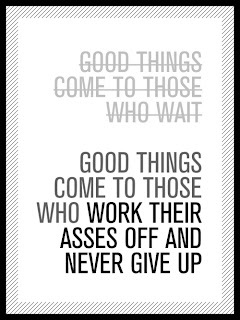 All of these things are great IF you are willing to put the work into them. The only way to success is to take small steps constantly. All those little things will add up over time. 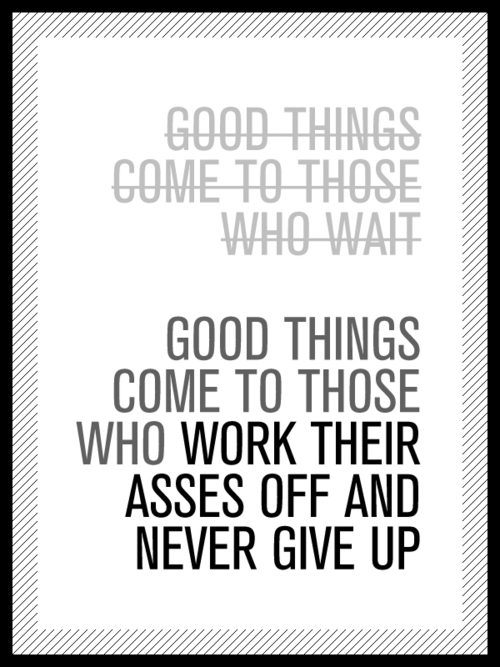 You have to do the work. So, rather than trolling the internet looking for new supplies, or a course on how to blog, ask yourself this, what could I do in the next 15 minutes that will move my business forward? I dream of being organized. I subscribe to www.flylady.net newsletters. I have all sorts of containers. This is not my picture... I wish!!! I also have one big mess of beads. I touched on my desire to be more organized in my blogpost A Beader's New Year's Resolutions. I figure I am not the only one who suffers from organizational procrastination and a gazillion half finished (or is half started) projects. It looks better in Excel.... I also have a column for the price of the tube and the size of the tube - but that still needs to be filled in. I will give little challenges to myself and hope that you will follow along. Think of all the duplicate beads we will not buy!!! Think of all the NEW beads we WILL buy!!!! Find all your PhD's (projects half done). Put each one in a ziploc bag with everything you need - or think you need for that project. Please comment with how many PhD's you discovered. Hiiiii-Ya. Release the Ninja smoke and prepare to bling up a storm. We have it - the Kellie Defries - (Crystal Ninja's) - patent (pending) Crystal Katana. I could tell you how this is her secret weapon for Crystallizing the heck out of everything that isn't moving - ooooor - I could show you the video! Wouldn't you know it - these got lost on their way here! But they are here now - so get 'em while they're fresh! And what's a Ninja without Ninja Smoke? Well - a Ninja without a cough, I suppose - but we do in fact have Smokey Quartz - so I suppose that is close enough. A whack of it, actually in different sizes and shapes! And if you'd care for something a little earthier, We have Red Tiger Iron, also in a variety of sizes and shapes! Tiger Iron is an interesting blend of stones: tiger eye, hematite and jasper. So, as always, wonderful, wonderful things - all over the site. I leave you to explore at your leisure. Click on a link or an image to go straight to the item mentioned above, or go to our massive list of everything, or if that page seems overwhelming - which we freely admit it is! - then try for bite-size portions by checking out these categories: Firepolish, Pressed Glass, Swarovski Crystal, Seedbeads, Stone and Pearls, Preciosa Crystal, Metal Beads, Other Cool Beads, Findings, Metal Clay & Supplies or Books, Kits, Tools. In keeping with my last blog about all the Swarovski crystal hearts that are available in the store, I thought I would bring you some videos made by Swarovski Create-Your-Style. Each of these videos show projects that incorporate hearts in the design. Packed with detailed step-by-step instructions, valuable trend information and useful tips on the best methods of application, an expert CREATE YOUR STYLE trainer demonstrates how to make beautiful designs using romantic Heart Pendants from the SWAROVSKI ELEMENTS assortment. New Opportunities for Metal Aficionados! Do you like working with metal? Have you taken a soldering class and are looking to be able to do more? Do you dream about rolling mills and dapping blocks? If you have answered 'yes' to any of these questions, we have news for you! 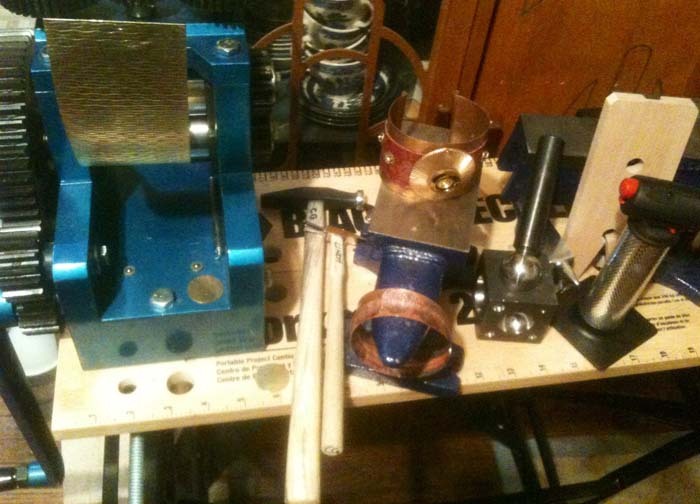 In addition to several new metal courses, we now have two open metal studios! This really isn't a class but is open to students who have already taken a soldering class at BeadFX. You can work on new projects or get help while you finish current projects. Iris will be on hand to lend her expertise with tips and techniques for soldering. Class fee: $20 (+HST); Kit fee: None! This is your opportunity to get to know the Metal Studio at BeadFX better and its many tools with a knowledgeable metalworker. 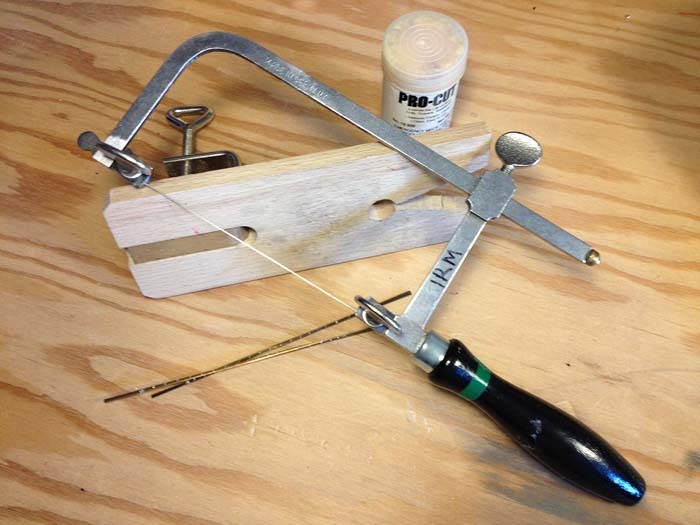 Try tools before you buy them, from dapping blocks to rolling mills to pliers and torches. Bring a project with you and the instructor will help you solve design dilemmas, or suggest ways to incorporate metal into your design work to take it to the next level. Anything goes in this relaxed, informative hands-on environment. Class fee: $20; Kit fee: None! Learn this Pandora style braided cord technique to show off those special one-of-a-kind lampwork and metal clay beads and pendants. This technique can be used with a variety of materials to create a range of looks from the delicate to bold man-jewelry. There are lots of new courses on the website including new metalworking courses by Cindy Goldrick; new seedbeading and loomwork courses by Maria Rypan; and felting courses by Dawn Liu-Smyth. Take a look! Short on inspiration? Look no further than our Pinterest boards! Here's a great idea, and so inexpensive. Paint an old dresser, and remove the drawers. The depth of a dresser is perfect for storing organized bins of craft supplies. We love the colours on this Vintaj piece. Gilders paste is a perfect accent for any of your metal beads. And last but not least - from our Beading Around the World board: Government Celebrations in Kangding, Kardze, Tibet 2010 | A Khampa Tibetan girl in a traditional ceremonial costume from Palyul county. She wears the traditional women's headdress in Palyul with many strands of turquoise, and a gold necklace across her forehead, nine necklaces of coral and contemporary dzi, and coral and dzi beads set gold rings on six fingers. The costume and ornaments are probably the belongings of her family, and contain much of the family's wealth and savings. The Business Chat - how useable is your online store? Early last December my phone rang with an area code I didn't recognize. It was a lovely woman from New Brunswick who wanted to order jewelry. I do have an online store however this woman had never bought anything online and couldn't quite figure the whole thing out. We had a great conversation and after 45 minutes I had walked her through the process and the order was placed. She was very happy with herself for finally buying something online and I was very happy that she could purchase more in the future. I don't know about you but I buy a lot of stuff online, (oh that late night habit!). I can figure most websites out and i just assume that others can too. Sometimes I forget that not everyone does this. One of the most important rules of success is to make it easy for people to give you money. No matter how great your stuff is people need to be able to pick it out, put it in a shopping cart and press the right buttons to make it show up on their doorstep. Even people who don’t understand the internet. If they can't figure out how to hit the Buy Now button and follow it up with the Complete Payment button then they can't give you money. Not all of them will call if they get frustrated halfway though. Most of them will just click away. After all, there are millions of other sellers online competing with you for their dollars. As oniine sellers we slave over our photos and our production descriptions, but rarely do we think about the basics like website usability and navigation. Can people find the buy now button? Do they have to sign up for an account to check out? (Etsy) Will they? Do they understand the process enough that they trust it with their credit card? This is a case where you can't see the forest for the trees. Of course your website makes perfect sense to you, it's yours. If you're wondering how useable your store or website is, ask a friend to find their way around. Here's how I have my website tested. First I set up a listing for one cent and called it The Test Necklace. You don't want your friends to have to actually spend money. Then I recruited 4 friends. I used 4 people of varying degrees of computer literacy. I asked them to start at Google, find my website and purchase the Test Necklace. I asked them to make notes about anything they found hard, or weird, or anything they felt could be better. The better experience our customer has means the more likely they are to buy from us again. And that's a win-win situation. About two years ago I was at a technology and innovation fair with my family and I saw something that gave me pause. It was a 3-D printer in actually printing out someones computerized design. It was rather mesmerising and it made be stop and think about the possibilities. Anyway to my surprise on of the most recent discussions on the metal clay forum was the topic of computer assisted design which morphed into the topic of 3-D printers. A three dimensional printer is a printer that will print an object into three dimensions rather than the traditional two dimension of the printers most of us use. This video below from a National Geographic Channel really explains the process well. It features Z-Corp a company that specializes in this technology. In this video 3-D printer replicates a working wrench with moveable parts and different colours all in one printing. You really have to see it to believe it. This all makes one wonder what the jewelry applications to this technology. There are 3-D printers that you use at home. The price ranges from $500 and up. Below is a video from one of the several vendors out there, Cubify. If you go to their site you can buy a 3-D printer and you can buy objects that have been made with a 3-D printer including a wide variety of jewelry. I am not sure if 3-D printing is for me as personally I like to get my hands dirty but the whole concept intrigues me. The individual in the National Geographic video talks about a secret agent that is mixed with a binder which is then set in the printing process. Sounds a lot like metal clay. Will we have our own home metal clay 3-D printers one day? Makes one stop and think. Valentine's Day is less than a month away! Don't wear your heart on sleeve, wear it on your neck, your ears and your wrist! beadFX has a huge selection of heart shaped beads available from pressed glass to Swarovski crystals. We offer many heart themed inspirations to make yours skip a beat! Please check out our main page and use the search function to find all the heart beads and inspirations available. There are too many to list here!!! The Business Chat - One step at a time.